There are various types of Sundarbans hotels and resorts to choose from, depending on your budget and what kind of experience you want to have. However, given that it's an eco-sensitive area, accommodations are more simple than luxurious, with an eco-friendly focus and village feel. Power is limited (it's either solar or produced by a generator) and water is not always hot. Do note that there are two main areas where you can stay at the Sundarbans. Nondescript budget hotels can be found at Pakhiralay village area, on Gosaba island (the main island before the entrance to the Sundarbans National Park). However, to have the most meaningful local experience and enjoy nature, you'll want to stay on a lesser-developed island, with the best options for accommodations mentioned below. Most hotels provide package tours from Kolkata, which is useful if you don't want to have to have to travel independently (the journey is quite a laborious one). Some Sundarbans tour operators also have their own private accommodations as well. It's worth taking a look at what they have to offer if you're interested in going on an organized tour. Plan your trip there with this Sundarbans travel guide. Help Tourism offers tour packages of two to four nights, staying at the camp. Expect to pay around 40,000 rupees for a two night package for two people, inclusive of all meals and activities. The luxury Earth Villa is a new addition, which accommodates up to six guests in two interconnected rooms. It costs around 20,000 rupees upwards for two nights, including food. Another similar but smaller community-based eco-tourism initiative on Bali island, the newer and lesser-known Tora Eco Resort & Life Experience Center has been named after a Mangrove species found there. Tora also means "tiger" in Japanese. 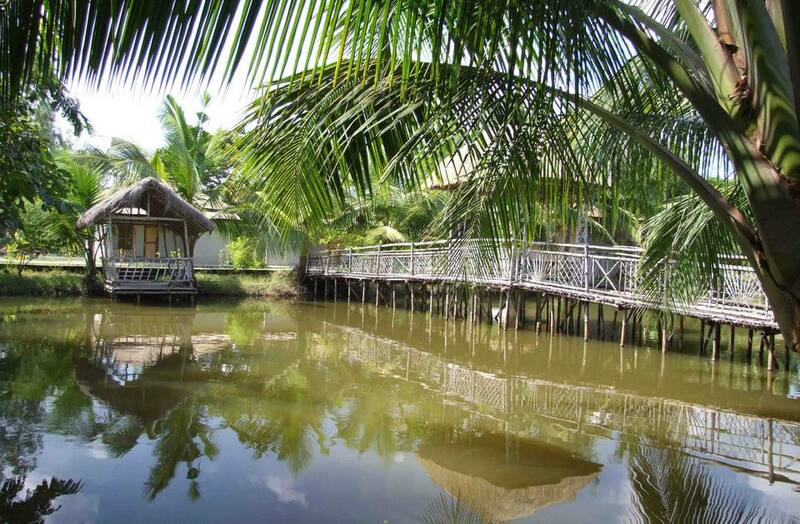 The resort has six smart and attractive ethnic mud cottages, with modern attached bathrooms, made from local materials in traditional rural style. Packages ranging from one to three nights are available. Activities include village walks, visits to various watchtowers, country boat rides, and entertainment from local villagers. Expect to pay 5,500-6,500 rupees per night for two people, including all meals. More information is available from the Tora Eco Resort website. Perhaps the most popular place to stay in the Sundarbans, Sundarban Tiger Camp is located on Dayapur island upriver from the Sajnekhali watchtower complex. It's well-managed and offers a range of accommodations, with varied amenities, that won't drain your wallet too much: 21 canvas huts, deluxe mud cottages, and air-conditioned executive rooms and cottages. A local artist has decoratively hand-painted the interiors of the cottages. The Camp has plenty of facilities such as games room, library, bar, and souvenir shop. Plus, it has its own private lake, ideal for watching migratory birds. The Camp runs sought-after fixed departure package tours from Kolkata. Rates start from 13,900 rupees for one night for two people in a cottage including accommodations, transport, meals and motor boat trip (country boat trips are additional). For two nights, it's 23,599 rupees. A relatively new eco-friendly property, Solitary Nook is also situated in serene surroundings on Dayapur island, about a 10 minute walk from the jetty. The property has seven cottages, each with a king and queen sized bed, scattered around a lotus pond. There's a special honeymoon cottage for couples, and two dormitories. All have attached western bathrooms and running water. The property also has its own in-house chef that prepares tasty meals for guests, served in the outdoor dining pavilion. Expect to pay around 2,700 rupees per night, for a double. This price is for room only. Various packages are offered for both couples and groups, including meals and activities. Tour itineraries include visits to watchtowers and villages, and evening folk performances. Bicycles are also available for hire. Sajnekhali Tourist Lodge is a government property that's operated by the West Bengal Tourism Development Corporation. Its main appeal is its handy location right next to Sajnekhali watchtower complex (it's the only place to stay within the core national park boundaries), inexpensive accommodations, and the ability to easily arrange your own private boat trips from there (no costly tour packages with hordes of other people). Don't expect anything fancy though. The lodge is an old wooden structure, with basic facilities, and could be better maintained. And, you will need to make your own way there from Kolkata. Rates start from 1,800 rupees plus per night for a standard double room, including breakfast, and go up to 3,000 rupees for an air-conditioned suite. Dorm beds are also available. Bookings can be made online here.